The Base of Operations, or BoO, is your main personal hub that you will upgrade during your journey to level 30. But what exactly can you do in the Base of Operations? Here is our detailed guide on how to unlock each wing and what upgrades you can get from each. The Base of Operations is separated into 3 wings, Medical, Security and Tech. To unlock each of these, you need to rescue a person to handle the operations of each of those wings. After you unlock the Base of Operations, this is the very first main mission available to you is the Madison Field Hospital. It is found right across from the Base of Operations. It’s a fairly simple mission where you get to learn the basics of how combat works in The Division. When you complete this mission, you will unlock the Medical Wing. This wing is unlocked by completing the Lincoln Tunnel Checkpoint found in the Hudson Yards area, west of the Base of Operations. This main mission has a recommended level of 5 so we do highly recommend you complete it as soon as possible. This is especially important because once unlocked, you get a 10% experience gain perk which will help you level up faster. This wing is the final of the 3 wings that you can unlock in the Base of Operations. The mission, Subway Morgue, is found in the Pennsylvania Plaza, east of the Base of Operations. It has a recommended level of 6. This wing contains most of your offensive skills and plays a big part towards your end game gear which we will get into detail later. Check Patreon on how you can help our site! Upgrading each wing is how you unlock all your skills, talents and perks. Each wing has its own currency, called supplies, and you earn these supplies from completing main missions and encounters. Here is a table for each wing and what each upgrade gives you. 3. Perk: Unlock Advanced Weaponry Vendor. 3. Perk: Incendiary bullets duration increased by 10 seconds. 4. Perk: A chest will now give 1 Explosive and Incendiary bullets, per hour. 2. Talent: Death by Proxy - destroy an enemies deployed skill and increase skillpower by 20% for 30 seconds. Skill Mods – Adds additional effects to each skill. Only one mod per skill at a time. Signature Skill – Essentially an ultimate skill. You can only have one equipped. Perks – passive skills that are active at all times. Two of the most important vendors for the end game. Once unlocked, you will be visiting these two stations quite often. 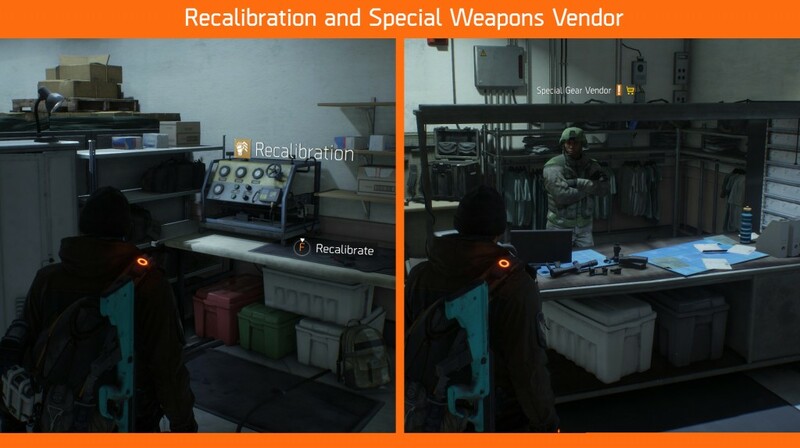 Recalibration is unlocked by upgrading the Tech wing and the Special Weapons Vendor is unlocked once you hit level 30 and completed the final mission. 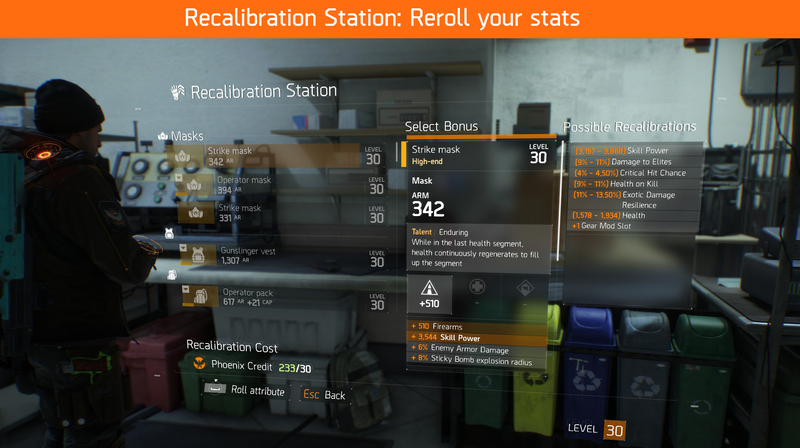 Recalibration is where you get to re-roll the stats on your gear. This can be to replace a stat entirely, add a mod slot or just to get a higher roll on an already wanted stat. Take note however, the price for a recalibration increases the more you recalibrate a specific gear piece. Also, once you select a stat to reroll, you can only reroll that stat over and over. So example, you reroll a major attribute from skill power to critical hit chance, you cannot try to reroll your firearms into stamina. You can only reroll critical hit chance into another major stat. Special Weapons vendor is especially important because of all the high end blueprints he sells. High end, or yellow gear, is the best quality of weapons and gear you can get in the game at the moment. 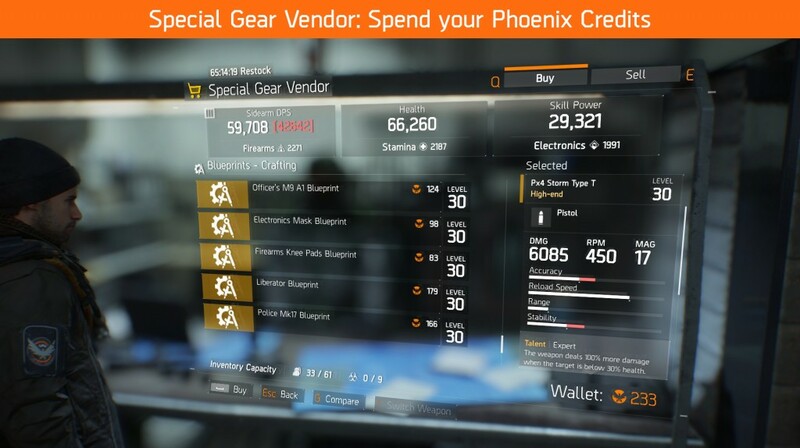 Buying blueprints from him requires you to spend Phoenix Credits, which are earned through daily missions. Blueprints can be used in the crafting station inside the Base of Operations but will also require high end crafting materials to craft. 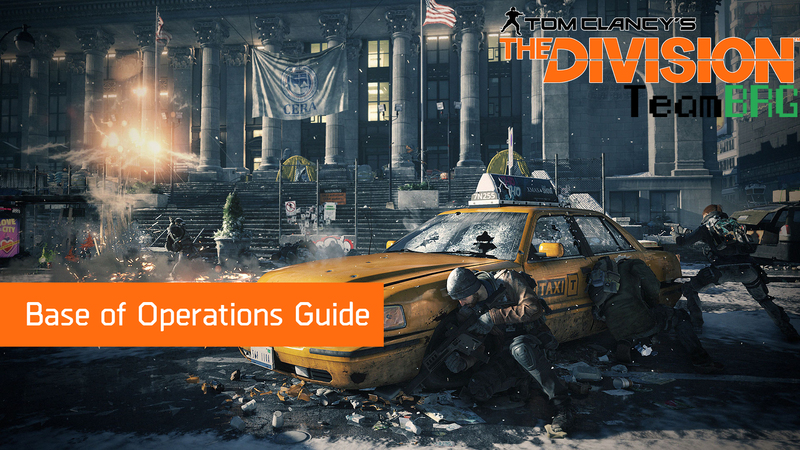 And that’s it for TeamBRGs “The Division – Base of Operations guide”. Stay tuned for much more in depth guides coming soon! Like us on Facebook! Support us on Patreon!